The "Save the seas" scenario receives with version 1.87 a new update that we believe will give more dynamism to the player. We are referring to the speedboats', small boats loaded with plastics, which appear randomly, often at the worst times, and which we must pursue in order to prevent them from throwing plastics into the sea. These plastics are the reason why we are on board a fundamental mission for humanity: to save the seas from complete destruction. Speedboats, when fast is not enough. Obviously, a helicopter is faster than a speedboat. But it is also true that the manoeuvrability and responsiveness of the boats is far superior. 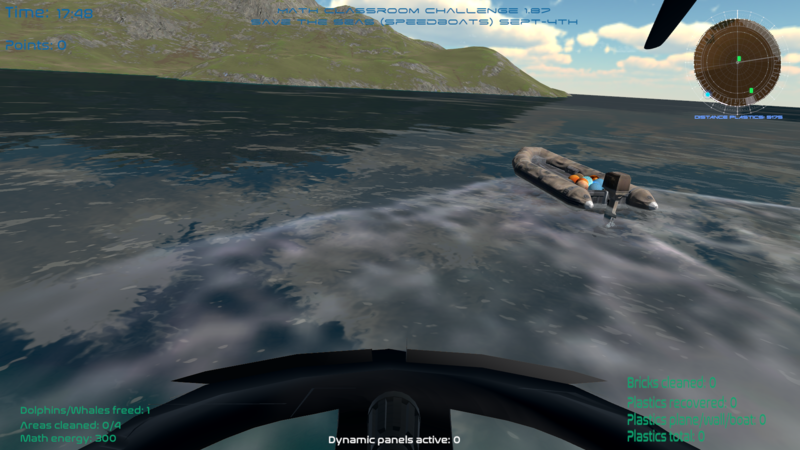 In "Save the seas" we wanted to develop a challenge that is balanced and a dare for the player: to pursue these speedboats, which contain plastic inside them that will be thrown into the sea if we do not stop them in a certain time.Obviously, a helicopter is faster than a speedboat. But it is also true that the manoeuvrability and responsiveness of the boats is far superior. In "Save the seas" we wanted to develop a challenge that is balanced and a dare for the player: to pursue these speedboats, which contain plastic inside them that will be thrown into the sea if we do not stop them in a certain time. An optional but attractive mission. Like other elements of the scenario, pursuing these boats is optional. The only mandatory task in "Save the seas" is to clean the areas of plastic and debris indicated on the radar at the white spots. But are you gonna be satisfied with that? You can get much higher scores and records by performing the optional actions presented in the game. Of these, the pursuit of speedboats is undoubtedly the one that requires the greatest concentration in the shortest possible time. And it gives a good amount of points and energy for the helicopter and the drone. While it was hard enough to clean the seas indicated on the radar without disruption, now these boats are asking to be chased and their plastic removed. The game is designed so that the boats appear randomly is true, but there is more to it than just randomness in its design. That, of course, you'll have to find out for yourself. "Save the seas" version 1.87 is now available, along with the rest of the elements of the scenario, and with the rest of the scenarios of "Math Classroom Challenge". We're at this moment preparing new features of course, including submarine operations. We hope you enjoy cleaning the seas. Thank you very much.